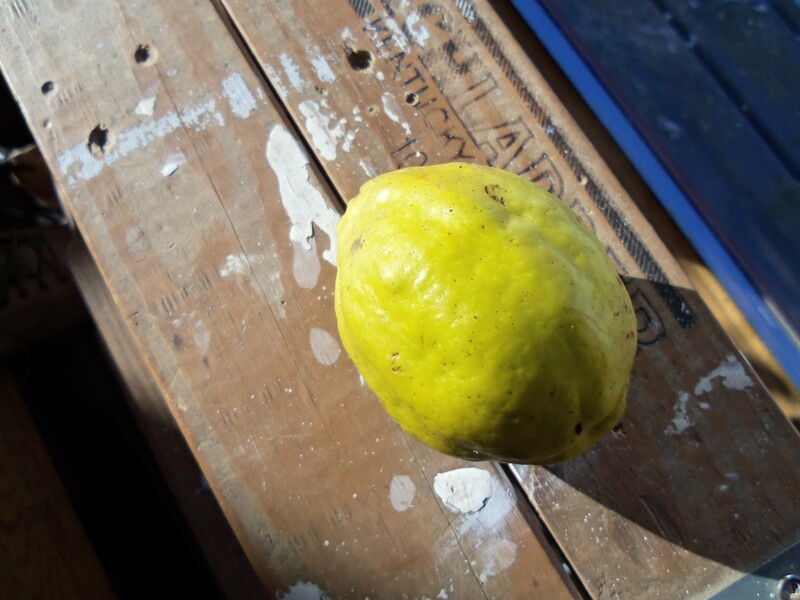 I am well accustomed to cooking with quinces, but when we moved here it was difficult to find a source. 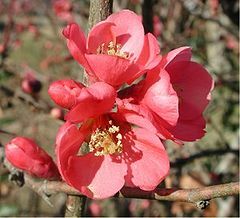 So I decided to try some Japanese quinces (chaenomeles) from those ornamental shrubs which are quite common in local gardens. Although I don’t have any of my own, most people are only too happy if you volunteer to remove them in October when they start littering the ground around them. So, thanks Connie for my supply this year. 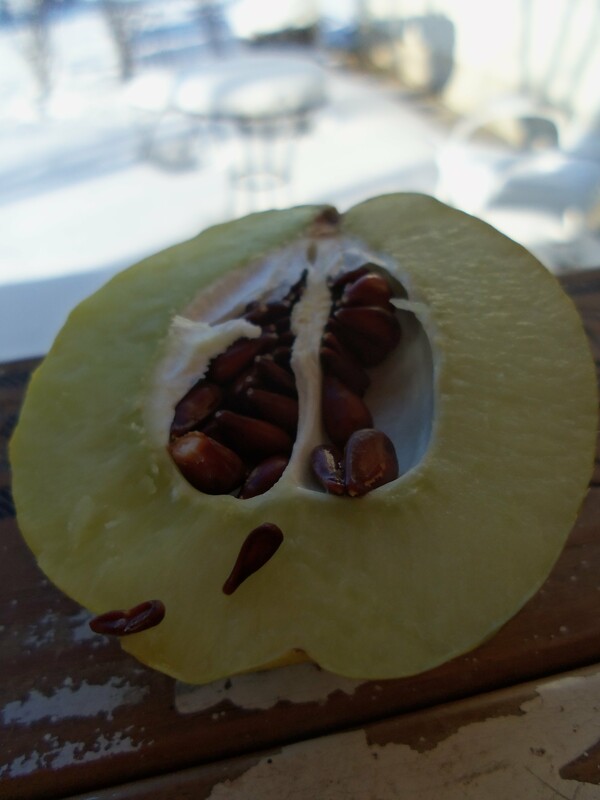 They are smaller than the tree variety (true quince or Cydonia oblonga), and have a large centre full of seeds resembling apple seeds. The taste is very lemony – more so than lemons. Wherever you store them will soon become permeated with the most heavenly scent, and they can be stored in a cool place for several weeks. They can be used pretty much in any regular quince recipe. For centuries they have been used in Asia for medicinal purposes, and recent studies confirm this. For more about the nutritional and medicinal value, check out this site. With my small stash I made a jelly and a chutney. There seems to be some doubt as to the value of the fruit as a jelly, but I suspect people who claim that have never actually tried it. I find the flavour delicious on its own, but if you want to experiment, a little orange or chilli or whatever you might add to apple would work well. Also, even though they are rock hard, preparing them was not a big chore. Place the cut quinces in a pan and barely cover with water. Bring to a boil and simmer for about two hours. Mash lightly with a fork. Strain the compote through a cheesecloth lined sieve and let sit overnight, or at least a few hours. Pour the liquid into a pan and add the same volume of sugar. Cook slowly (about 1 1/2 hours) until it is ready. Skim off the frothy bits as it heats, and keep a close watch. I usually overcook jelly, so I tested a small amount of liquid on a plate straight from the freezer. When it stays in one place you know it is ready. I am more a chutney than a jelly fan, so I used the remaining pound of quinces to make some. I never follow recipes for chutney. To me, chutney is a way to use up excess fruit, just mixed with vinegar, sugar and spices. It is pretty hard to go wrong. And you have one of the most useful staples in your fridge to show for it – as a condiment, in a cheese or grilled vegetable sandwich, mixed with yoghurt or mayonnaise for a dip, or just with crackers and cheese. 1 lb quince, seeded and chopped. chilli peppers, or chilli flakes to taste. Place all ingredients in a saucepan. Bring to a boil and simmer until thick (about 2 hours on a low heat). I used two whole cayenne peppers, with seeds, chopped very finely. But the variety and amount are your call. Categories: condiment, recipes, wild fruit | Tags: condiments, fruit preserves, Japanese quince, jelly, quince, quince recipes, wild fruit | Permalink. And so begins the first of my experiments in making pasta with Jerusalem artichokes. Although you can buy the flour at some health food stores for an exorbitant price, there are still few recipes out there which use it. It seems that, so far, its only use is to take it as a remedy or food supplement rather than treat it as a worthwhile food in its own right. So I made gnocchi, with the flour, and with gluten-free (rice) flour. Of course, you can use wheat flour too, which in fact would make the rolling process a little easier, but I wanted to make sure that a gluten-free version was feasible, and even tasty. Mash the potatoes thoroughly. Add the eggs and beat or at least stir vigorously. Gradually add the flours and salt and mix until all the dry ingredients are blended in. Knead it a bit until it sticks together well. Roll out about a lemon-sized bit of dough at a time into a rope, and cut the rope into pieces of about 3/4 of an inch. Cook a few at a time in boiling water. When they come to the surface (it only takes about a minute) spoon them out with a slotted spoon. To make the sauce, I heated a little oil and butter in a frying pan, added some onion or shallots, garlic, fresh thyme and sage, and after a couple of minutes added the cooked gnocchi and fried until the gnocchi were lightly browned. Any other pasta sauce would work well. They would be good I think with either a tomato or cream sauce with lots of herbs, olives, cheese etc. 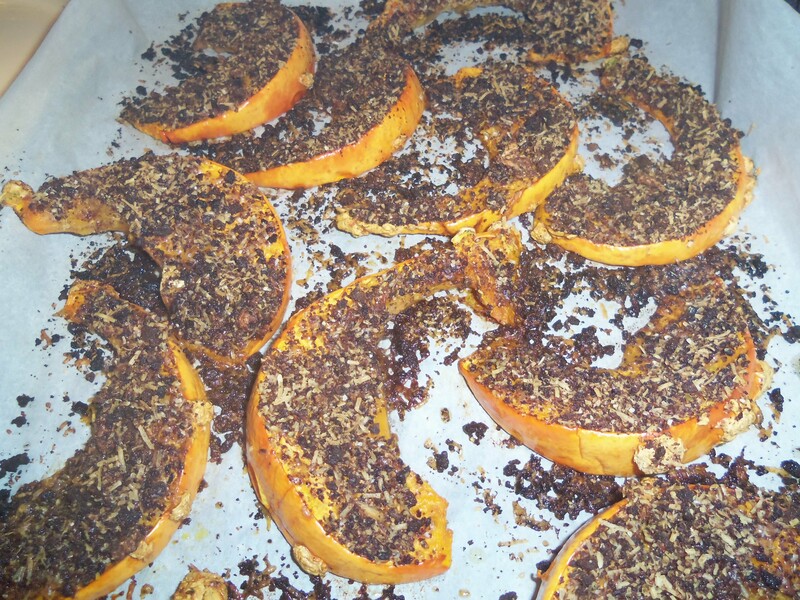 I served mine with crusted squash slices, based on a recipe I used from Yotam Ottolenghi, which he calls Crusted pumpkin wedges with sour cream. I made a few changes, which is why my picture looks different from his, i.e. much darker. For bread crumbs, I used purple bread, which is something I will explain in a future post, but if you don’t have any of that handy, just use bread crumbs of your choice. I also used powdered sumac instead of zest of 1 lemon, but in case you have run out of sumac, feel free to revert to the lemon. For the squash, I used a peanut squash. This was the first year I grew that variety. 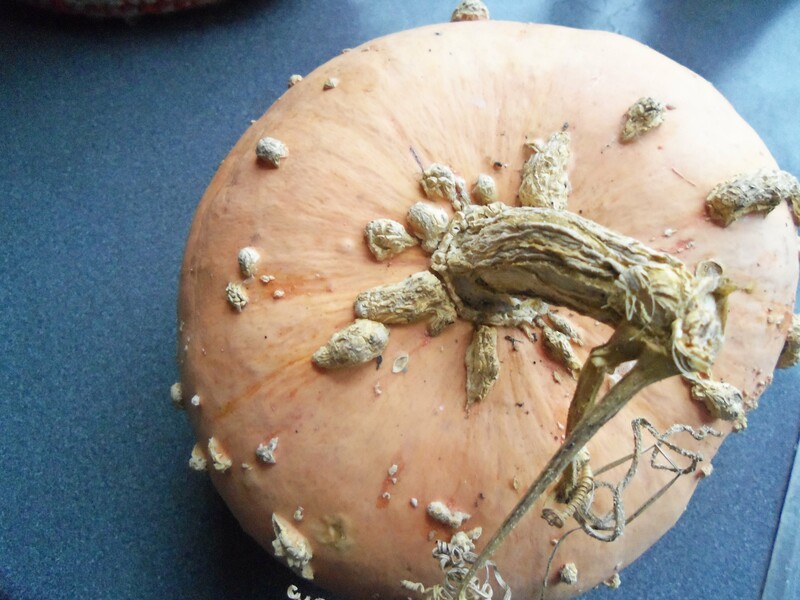 I like it because its little peanut shapes all over the skin are amusing, but you can use any kind of squash you like. Another variation on Ottolenghi’s recipe is that I had some corn husks on hand instead of aluminum foil. He recommends that if the crust starts to get overcooked before the squash is done, place some foil on it. Without wanting to sound too sanctimonious, I do not like using aluminum, so I have frozen some steamed corn husks for purposes such as this. They are compostable, water-proof, and free. However, there was no need for it after all, but I just wanted to share this tip with you. You could use, should you have them, any non-toxic leaf, such as grape leaves. Preheat oven to 375 F. Cut the squash into 3/8 in. thick slice and lay them on a baking sheet that has been lined with parchment. Mix together the Parmesan, breadcrumbs, parsley, thyme, sumac, garlic, salt and pepper. Brush the squash generously with olive oil and sprinkle with the crust mix, making sure the slices are covered with a nice, thick coating. Gently pat the mix down a little. Place the pan in the oven and roast for about 30 min, or until the squash is tender. I served the gnocchi on a bed of steamed malva and dandelion leaves, taking advantage of the last days I was able to pick greens from the garden. By tomorrow, they will all be covered in the white stuff according to the weather forecast. To accompany the squash, I mixed fresh chopped dill with plain yoghurt instead of sour cream. Categories: edible weeds, garden vegetable, jerusalem artichoke, main dish, recipes | Tags: corn husks, gnocchi, jerusalem artichoke flour, Ottolenghi, peanut pumpkin, purple bread, sumac, wild greens | Permalink. I was recently nominated by Superfoodista for a Versatile Blogger Award. I was very flattered to be among her list of nominees and delighted to find that my blog is being read and appreciated by someone of her calibre. 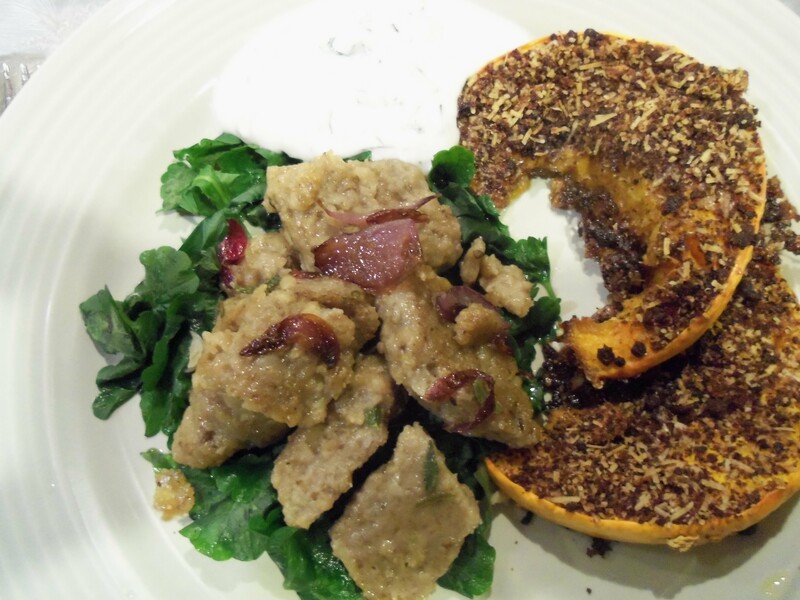 Check it out for yourself – her blog is full of original, healthful recipes and enticing photos. She sets a high standard and level of inspiration for novice bloggers like myself. Having given the subject lots of consideration, and wishing to accept this nomination, I decided I cannot meet the requirement of nominating at least a further ten bloggers. Actually I could, but there would be a lot of duplication with the ones she already nominated. This blogger world is smaller than I thought. Or maybe I just need to be more diligent in blog-following and support those who put so much time and effort into posts I enjoy reading. But, as I said, I am a novice, and still learning the ropes. So a big thank you to Superfoodista, and while I am at it, all those who read and respond to my posts. You probably have no idea how encouraging it is to an amateur blogger like myself whose only goal is to explore the world of local wild foods and share my findings with anyone who is interested to know that my efforts are not just sent out to vacuum land. And also, a thank you to all those whose own blogs serve as such an inspiration for my own endeavours. I have not enjoyed cooking in a long time as much as I have since learning from your recipes. This is the season for baking, and this year I have decided to go wild, using as many of the foraged fruit preserved during the summer months as I can. Since I do relatively little baking, this is a great excuse to make some of my traditional recipes more interesting with some new and local flavours. 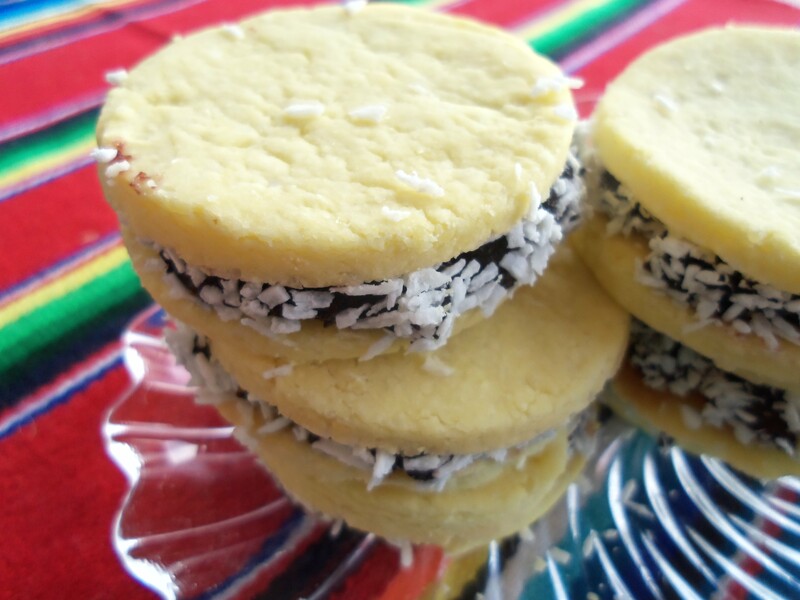 My first recipe is for alfajores. These treats are from Latin America where every country or region has its own version. As the Arabic sound of their name suggests, they were brought by the Spaniards during the conquest, who themsleves acquired some form of the recipe from the Moors . This recipe is gluten-free and uses less butter than the traditional. The most common filling is dulce de leche, but I have seen different fruit preserves used as well, and much prefer them. So as part of my wild menu for the holidays, I have made them with my own dulce de manzana silvestre, or crabapple preserve, and used only dried coconut to embellish them. Mix together all the ingredients except for the coconut and roll into a ball and knead until it all sticks together. If the mixture is too dry to stay in a ball, add a few drops of water. Set aside to rest for half an hour. Roll out to 1/8 inch think and cut into rounds of about 1 1/2 inches in diameter. Bake at 300 degrees F for about 10 min. They should be cooked but not browned. 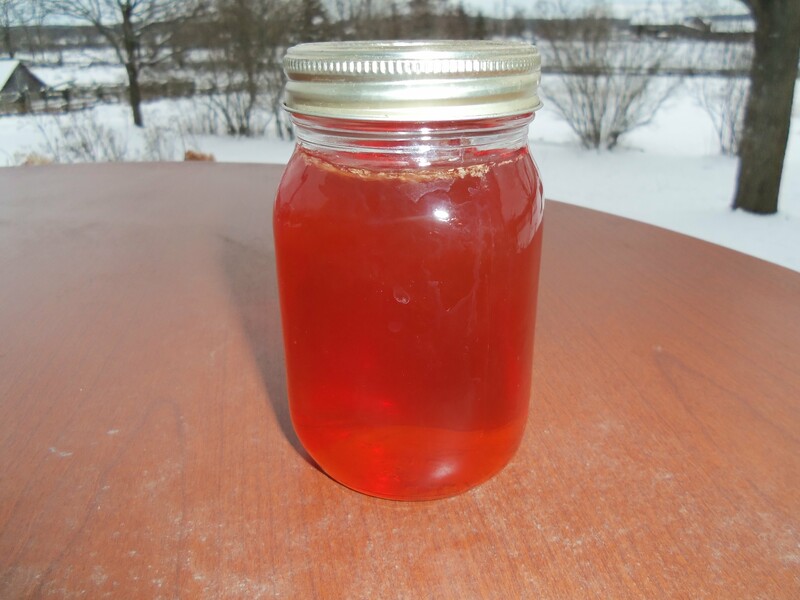 Once cooled, spread crabapple preserve on the bottom of one, and place another on top to form a sandwich. Roll the edge of the circle in shredded coconut or chopped nuts. My next recipe is the anglo equivalent of alfajores. Simple and ubiquitous, shortbread too has as many versions, and if you have a favourite recipe, simply add the sumac powder to give it a local, lemony flavour. 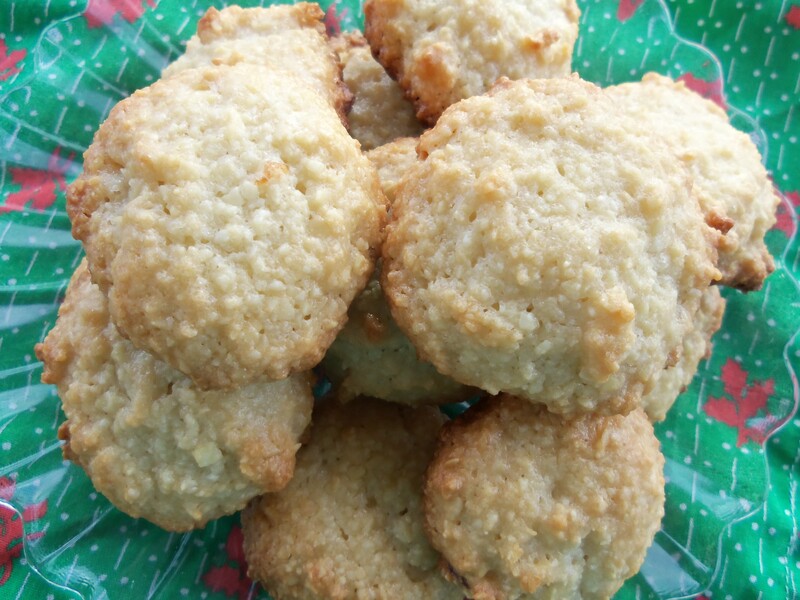 The recipe I used is a traditional one from Grace Mulligan’s Dundee Kitchen: A Scottish Recipe Cook Book, and is as basic as a shortbread recipe can get, which is the way I like it. I made mine in cookie form, slicing them thin, but you can roll out the dough thicker and make petticoat tails, rectangles or put them in a mould. If you haven’t prepared your own sumac powder, you can find it in some specialty Middle Eastern or Asian shops. Cream the butter and add the sugar. Mix the sumac powder into the flour and gradually work into the butter mixture. Knead it until it forms a good ball, or use a food processor. Divide the ball in two. Cover the work surface with a little sugar and roll out each ball into a log shape. Cover and refrigerate for about half an hour. If they get too cold, they will crumble when cut. Cut the rolls into thin slices, place on parchment paper on a cookie sheet and bake at 300 F (150 C or Gas Mark 2) for about 15 minutes or until they are lightly browned. And if you make alfajores according to the recipe above, you will have three egg whites you will want to use. In order to help you decide how to use them, I am recommending this recipe from David Lebovitz to add to your holiday baking. I followed his recipe to the letter, except did not do as he suggested and coat them in egg white and nuts, because then I would have to do something with the left over yolk. Anyway, they were fine and I saved myself a lot of work. a few drops of almond extract. 1. Beat egg whites until they form soft peaks, but are not dry. 2. Mix almond powder and sugar. 3. Fold egg whites into the almond mixture with marmalade or jam and almond extract. 4. Form into balls (about the size of walnuts), place on a parchment lined baking sheet, and bake at 325 for 25 or 30 minutes. Categories: baking, dessert, recipes, wild fruit | Tags: alfajores, almond cookies, almond powder, amaretti, Christmas, cookies, crabapples, dessert, dried sumac, egg whites, Italian cookies, pastry, shortbread, wild fruit | Permalink. When in New York last week, I had to visit the famous Rice to Riches in Lower Manhattan. Their website is under construction, but you can find a list of their rice pudding flavours for delivery, and will give you an idea of how this little shop gives this lowly dessert a whole new makeover. Something like an ice cream parlour, and just as busy, they serve puddings of every imaginable flavour with catchy names, like Almond Shmalmond, Take me to Tiramisu, and Fluent in French Toast. And toppings! When I first heard about it last year, I decided to try my own hand at making rice puddings of an unconventional sort. As a base I used 1 cup arborio rice, 2 cups water, and 1 cup coconut milk. To that I added flavourings, such as rose or orange blossom water, or lavender. But vanilla, nuts, fruit or whatever would work just as well. I combined all these ingredients, added a little sweetener (I usually used coconut sugar). But this is a blog about wild foods, so I can’t try and recreate even their Secret Life of Pumpkin for this space. However, I can share with you my recipe for sumac rice pudding, which by the way cannot be found at this NYC restaurant. I’m sure there are many other wild edibles which would make interesting puddings, but one at a time. I used sumac molasses for this, so there was no need to add any sugar. However, you could probably use powder or sumac tea and add sugar as necessary. Combine all the ingredients in a saucepan and cook covered, stirring occasionally, over medium heat for about 1/2 hour, or just until the rice is thoroughly cooked. The pudding will set as it cools, so don’t worry about it being too saucy. And feel free to be creative with your own toppings, although I personally prefer it just with a few toasted nuts and some sumac powder. Categories: dessert, wild fruit | Tags: coconut milk, dairy-free, gluten free, pudding, Rice to Riches, sumac molasses, sumac powder, sumac rice pudding, wild fruit | Permalink. 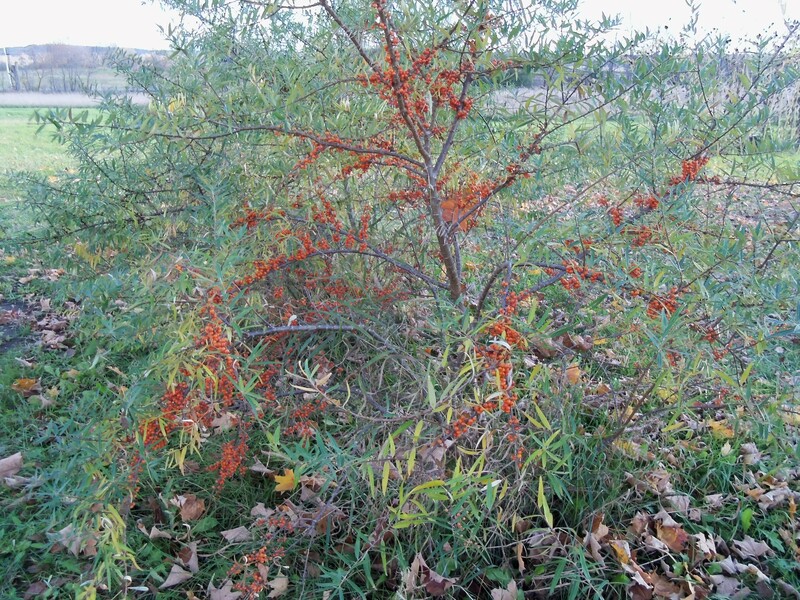 Unless you live in North West Europe or Asia, you are not likely to come across this bush in your foraging expeditions, but luckily the plant has been introduced recently to the Americas and is gaining popularity for its health benefits, taken either internally or topically. Occasionally it can be found at farmers’ markets in the fall, and all kinds of beauty and medicinal products are appearing in pharmacies and on- line. I was drawn to it long before I realized how healthful it is – it has a tart flavour and beautiful colour of leaves and berries, so I planted some in my garden five years ago and transplanted it when we moved one year later. The surviving four of the five original plants did not look promising, and I feared I maybe had bought all of the same gender (you need male and female plants). I was really excited when this year the three smaller plants produced an impressive quantity of fruit. If you are interested in reading more about this super plant, check out this site and this blog. As it is not the easiest thing to pick, I harvested only about half, and so far have frozen some for further use, and used a few to make a Sea Buckthorn infused vinegar. This being my first attempt at using it, except as fresh berries, I wanted to keep it simple, and maximise the use of the few berries I managed to pick. The branches are thorny, and the berries grow so close to the branches that it was a bit of a challenge. Just remember when you see the high prices of the products made from these berries, that might be the reason. To make the vinegar: Put a handful of berries into a clean mason jar. Cover with organic cider vinegar. Weigh the fruit down so none of the berries is floating on top and exposed to air. I used clean marbles wrapped in cheesecloth. One common method is to put water in a sealed plastic bag, but I did not want to submerge plastic into my pristine vinegar. Leave it in a cool dark place for a couple of weeks. This is particularly good on coleslaw. Sprinkle a few berries right into the salad. Categories: recipes, wild fruit | Tags: berries, coleslaw, local fruit, organic, Sea buckthorn, vinegar | Permalink. I thought the sumac fesenjun was so good it would be worth trying as a vegetarian dish. The sauce itself has enough flavour that not much was required to replace the chicken. The recipe I came up with is easy to prepare, nutritious, and really delicious. I simply used a mixture of buckwheat and green lentils with seasoning. The balls can be prepared and frozen, with or without the sauce. First, a couple of points about the ingredients I used. Buckwheat is not wheat, it contains no gluten, and is not even really a grain, although it serves the same purpose in cooking. 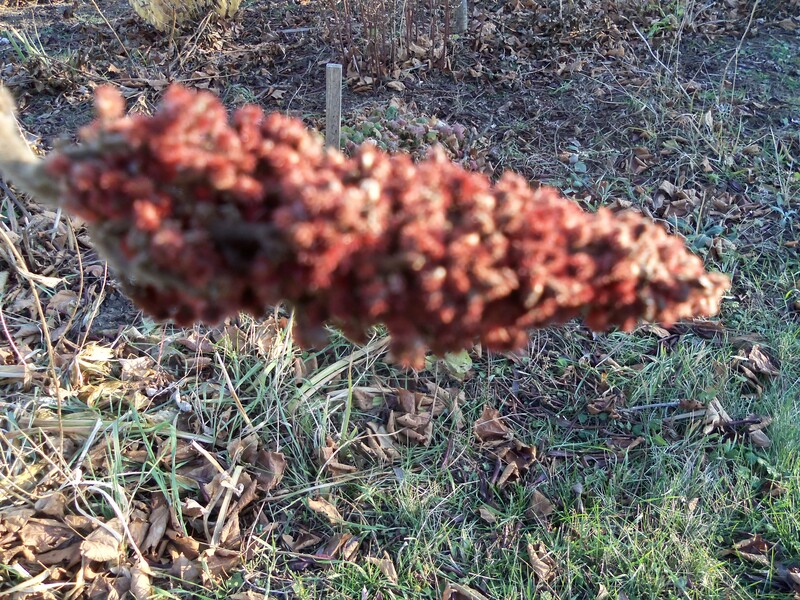 It is a fruit seed related to rhubarb and sorrel making it a good substitute for people sensitive to wheat or other grains containing protein gluten. Health benefits are just too numerous to list here, but it is easy to find sources describing this ‘superfood’ if you are interested. I recommend this blog for more information and great recipes. I used groats rather than the roasted groats often associated with kasha. Either will work here. The unroasted groats seen here are pale tan to green where the roasted ones are a darker brown. Green lentils, or puy lentils are what I chose to use in this recipe. They take a little longer to cook than most other lentils, but have a nutty flavour and colour (they turn brown when cooked), and firm texture which worked well for this particular recipe. However, feel free to use other lentils if that is more convenient. Sumac molasses is a substitute for pomegranate molasses, so if you don’t have access to the former, you can easily subsitute it with the latter. To make the balls: Cook the lentils in water until they are soft and almost all the water is aborbed. (They will continue to absorb more water as they cool, so don’t drain them completely if there is still a lot of water after cooking). Prepare the buckwheat as you would rice, or according to package instructions. Mix the cooked lentils and buckwheat together until they are thoroughly combined, season with salt and pepper and roll them into balls (this recipe makes 16 balls of about 2 in. in diameter). To make the sauce: Fry the chopped onion until soft, add the chopped walnuts and fry another 2 minutes. Add the molasses and remove from heat. 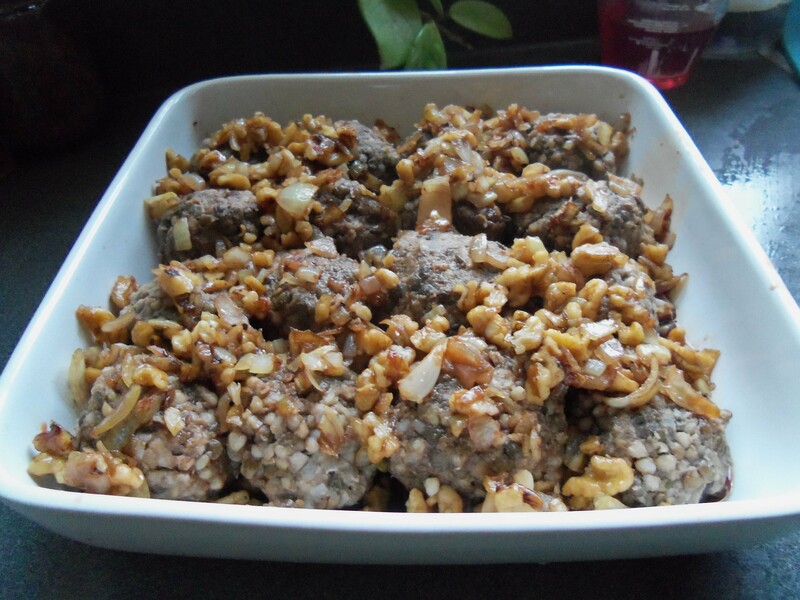 Pour the sauce over the prepared balls, and place in a 350 F oven until warmed through – about 1/2 hour. Because there is already buckwheat in the recipe, I chose to serve them simply with steamed and sauteed vegetables. Categories: main dish, recipes, wild fruit | Tags: fesenjun, gluten free, green lentils, pomegranate molasses, puy lentils, sumac, sumac molasses, vegan, vegetarian meatballs, walnuts | Permalink.